Your search for a trendy headphone with great comfort should end on Bose QuietComfort 35 Series ii. Launched in Sep 2017, it’s an updated version of one series but with a dedicated Google assistant button. It not only features great sound but also superb noise cancellation feature. Wireless technology is updating with time and Bose QuietComfort 35 is just an example of a great technology. It features the microphone system with a unique noise cancellation application. What’s more, you can also share your music with music sharing compatible Bose headphones. The noise cancellation feature in the headphone lets you enjoy your music without any disturbance. If there is no sound around, it’s sure to make you glued to your favorite playlist. With so many enhanced features, this will surely be a top pick for people who love to hear music on the go. The features are extremely easy to use and in simplified form. Bose QuietComfort 35 ii also has great accessibility and support. What sets it apart from other headphones is the Google assistant feature. It not only lets you play your favorite playlist in seconds but it also helps you receive texts. During all this, you don’t need to glance at your phone. If you are still in a Prix to buy a good headphone, then you must go for Bose QuietComfort 35 Series ii. Apart from the Google assistant feature, this headphone is extremely light in weight and has a slightly better noise cancellation feature compared to other headphones. If you are a frequent traveler, then the headphone is best to reduce the noise of a plane or train. You can reduce the noise to a minimum with this headphone. Bose QuietComfort 35 Series ii can be easily connected to the app. So, if you are an app person, this can be a handy choice for you as well. The sound quality of the headphone is great and looks wise it’s stylish and sleek. The updated series headphone is not only great in looks but also features. The flip to switch feature in the headphone gets you in the music mode instantly. The built is better and it completely volume optimized. With volume optimized EQ feature, the sound resonates clear to your playlist even in a noisy environment. The noise reducing dual mic system makes your calls clear, so you can also talk on the go. The best part about Bose QuietComfort 35 Series ii is that it can be customized. So, if you like a headphone that can connect and adjust according to an app, then this is the best choice for you. Bose QuietComfort 35 ii allows you to adjust noise cancellation and that make this awesome as well. If the first series of the headphone impressed you, then Bose QuietComfort 35 Series ii should be your ideal pick. Price wise, it’s a great pick as well. It’s not too expensive. With the great features, this headphone offers, it’s fairly priced. There are many great features in Bose QuietComfort 35 Series ii as compared to the first series. Here are some key features. Noise-rejecting dual-microphone system not only gives you a great sound but also helps to make clear calls. It also integrates to voice access feature of your phone like Siri. It features up to three levels of different noise cancellation. Bose connect application lets you cancel the noise and you can also adjust according to the environment. It also lets you set the action button to the actual noise cancellation. It features the volume optimized EQ that makes this headphone truly great in sound. So, whether you are traveling or simply sitting at your home, you can adjust it according to the noises around. The level of noise cancellation can be adjusted according to your mood as well. It features NFC pairing with Bluetooth for great wireless connections. In fact, the Bluetooth gets connected in seconds, so it also saves a lot of time. A great Bluetooth feature is must for any headphone. It features up to 20 hours of wireless playback time and that lets you hear your music uninterrupted on a wireless mode. On wire mode, the QuietComfort 35's noise-reduction capabilities of the headphone can last up to 40 hours. It’s always great to have a headphone with such great playback time. If you are a Google Alexa fan, then you can also get to talk to Alexa through this headphone. Bose QuietComfort 35 Series ii will soon get an update that will connect to Alexa. So, you can just ask for your music or your messages. You can connect two devices with Bose QuietComfort 35 Series ii. It lets you connect your tab and your Smartphone. But, when you get a call, it automatically swaps to the device connected. Its Sidetone features allow you to hear your own voice, regardless of the noise reduction feature and that is great. The right ear cup features good volume control and a unique multi-function button that lets you control play, forward or rewind any track that you are listening too. Comfort wise, Bose QuietComfort 35 Series ii is great. As the headphones are light in weight, you don’t feel heavy while listening to music. It’s comfortable even if you listen to music all through the day. While buying a headphone, comfort is most important. Bose QuietComfort 35 Series ii is not only great in features but also awesome in comfort. The fit is just amazing as well, but if you have bigger ears then you might need to adjust a bit. Both the ear cups are large and perfectly fit the ears. The padding on Bose QuietComfort 35 Series ii is also well protected so you don’t need to worry about loud sound as well. Bose QuietComfort 35 Series ii headphone is comfortable so there is no pressure on your ears as well. Most people consider this point while buying a headphone. If there is no pressure, it makes the headphone comfier. Industry-leading wireless Bose QuietComfort 35 Series ii headphone lets you truly adjust the level of noise cancellation to suit your environment. You can adjust the sound according to the mood and ambiance. It gives you the same clarity while traveling and sitting in an isolated place. The new Action button in Bose QuietComfort 35 Series ii lets you take full advantage of the industry-leading noise canceling technology. It also helps to block out the world around you so that you can hear your music at your own pace. It works great even in the noisy environment. This is one of the main highlights of Bose QuietComfort 35 Series ii. Bose QuietComfort 35 Series ii headphone Corrosion-resistant steel and glass-infused nylon feature makes it ultra stylish. The design is foldable and you can carry it in a semi-hard case. It also features Alcantara lining for longevity. The soft padding around the ear cups makes the headphone ideal for long hours. The headphone can be easily adjusted to fit your head. The ear cups slide up and down a rail and they can easily rotate within their hinge. The headphone provides the right grip for your comfort. The active noise cancellation (ANC) is still the best feature of Bose QuietComfort 35 Series ii. ANC works best with low, steady noises so you can hear a clear voice in any environment. The noise cancellation feature has been extended to microphone for calls as well. The sound of the headphone is also clear with no buzzing voice. The bass sound is good but not that great. Overall, the sound quality of Bose QuietComfort 35 Series ii headphone is crisp if you compare it with other microphones available in this range. You can expect an impressive hearing experience with Bose QuietComfort 35 Series ii headphone. On a wireless mode, it has an impressive battery life of up to 20 hours from a rechargeable lithium-ion battery. You can hear your music nonstop without charging because of this great battery life feature. On a wired mode, it can go up to 40 hours. The charging is also quick so it saves a lot of time. Considering battery while buying a headphone should be your prime requirement. Bose QuietComfort 35 Series ii excels in battery feature and offers great playback time. There are no issues with connectivity and charging too. It offers superb noise cancellation feature. It has great mic support for incoming calls. Its comfortable and light in weight. It offers a great battery life. It has superb sound quality. Expensive as compared to mid-range headphones. Only fits in Bose case. You may feel the competitors sound better. 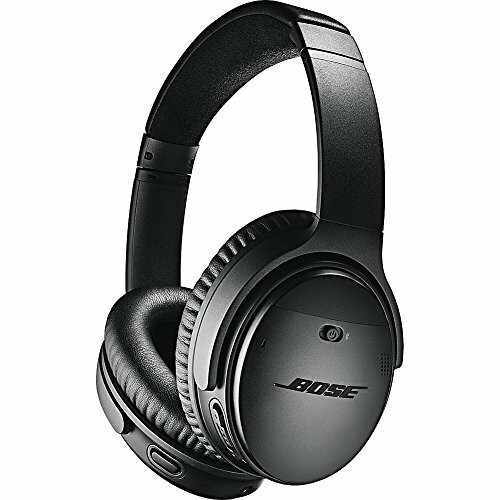 Bose QuietComfort 35 Series ii makes up for a best and top quality headphone. Its a top rated headphone and can easily fit in your budget. The noise reduction and soundproof feature make it a great buy. The battery performance is excellent and built quality is also great. The active EQ feature makes up for a great listening experience. Looking at the price, you must go for Bose QuietComfort 35 Series ii headphone. Hope you enjoyed reading Bose QuietComfort 35 Series ii review as much as I enjoyed writing it. If you have any questions then please do feel to comment below.